Wall Enclosure: 11.75 in. x 5.5 in. x 13 in. Covidien 8516H Wall Enclosure for 2 and 5 Quart Sharps Containers adds an extra layer of protection for any of your sharps containers with a locking wall enclosure, universally keyed cabinets and several other features that help keep medical professionals and patients safe in any environment. Created to keep the other plastic containers in one place, these can be completely locked away in order to have an extra layer of protection. 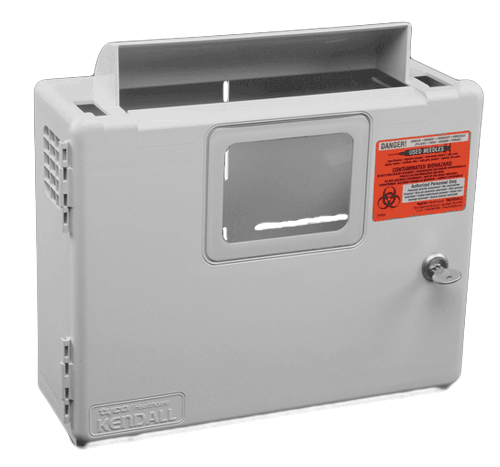 This keeps the container and all its contents in a highly-secure area, great for high-traffic areas of a hospital or other care facility. 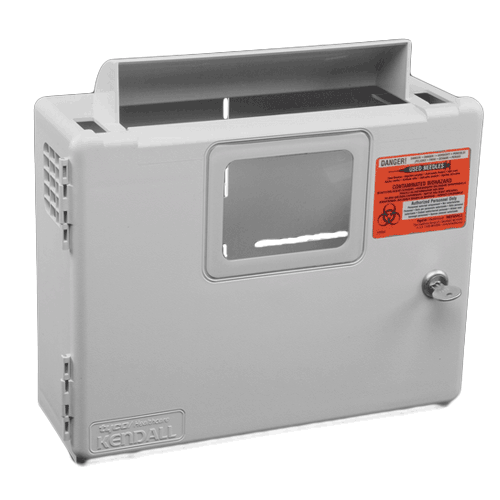 Universally keyed cabinets are added for extra convenience while the ABS plastic material used to make the Enclosure provide extra durability against damage. Three windows are available for the best view of how full the cabinet is, letting professionals know when it needs to be emptied. For added convenience there is an optional glove dispenser for quicker and easier access. The Wall Enclosure is available in a neutral beige color and has multiple mounting slots for faster installation. I just placed an order for this and just wanted to make sure that the hardware to hang this would be included. Hardware should be included with each order.